Sweet potatoes are an easy crop to grow, and you can grow them in many areas of Australia. The thing they dislike is frosts. We look at how to grow sweet potatoes and when to plant them. The secret to growing sweet potatoes is a long frost free growing season. And although they are seen as a ‘warm climate’ crop they can be grown in cooler areas as well. So planting time is in spring after the frosts have finished and the soil is warming up a little. Excellent in a no dig garden and we tell you how to grow sweet potatoes. An excellent vegetable roasted, iced in stews and curries and even as chips – Sweet Potatoes are increasingly popular in Australia and really there is no reason why most home gardeners cant grow them. One misconception is that they are a variety of potato, they are actually a different plant altogether. In Australia the common types include the orange skinned and purple skinned types, however a few more varieties are available inkling a white skinned and flesh type. Knowing when and where to plant is the key to success with most vegetables and sweet potatoes are no different. Start with a deep humus rich friable (lose) fertilise soil. Good sun and good drainage. If you have those conditions you are on your way. The two types are known as dessert and staple. The one we see in the markets most often in the orange dessert type called Beauregard, before this Jewel was popular. So why is it called a dessert type, because it is sweet and juicy. The Purple skinned Garnet and Rojo Bianco and white types are used in curries. The colour of the skin is not always an indication of the flesh colour. 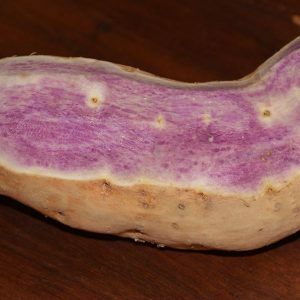 You can get White Skinned Sweet Potatoes with purple flesh as well as Red Skinned Sweet Potatoes with white flesh. When to plant sweet potatoes. Although you will see sweet potato seedlings for sale at various times of the year, for good results they need a warm climate and moisture. In frost free zones they are fairly forgiving, so you can plant them a little earlier if you wish. The best time to plant sweet Potatoes will depend on variety and climate. In Melbourne plant them in October, ready to harvest in March as the foliage begins to turn. You will need a warm sunny position, against a north facing wall is excellent. You will also need to keep them moist. In Sydney you can plant them a month earlier, September as a rule. You can grow from the tubers that you buy at local markets with very few problems. What you are looking for is a sweet potato with those ‘knobbly eyes’ on the outside, these are the growing points. If you store these in a cool dark position they will eventually begin to shoot, and away you go. You can also suspend the sweet potato in water, it will send up long shoots (slips), each of these can be planted. Simply cut the tuber into pieces with shoots on each, not to small usually about 20 – 30 cm long, usually no less than a 5cm slice. The new shoots will feed of the tuber slice until the root system develops. Assuming you have prepared the garden bed a few weeks before you are ready to plant. The tuber pieces need to be planted around 3 – 5 cm deep and with the ‘shoots’ up. Cover with soil and a layer of pea straw, lucerne or sugar cane mulch water in well. The shoots should be just showing through the mulch. Wait until the weather warms before planting out. Sweet potatoes need about 12 weeks of good warm weather to grow and produce good sized tubers. You will need a large container at around 40 – 50 cm deep and 40 cm in diameter. Use a premium potting mix designed for vegetables, and add about 30% compost. 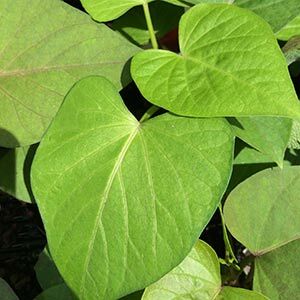 You can use slips grown from store bought sweet potatoes, or seedlings. Wait until the slips are 30 cm long and then remove them from the old sweet potato tuber. Plant them spaced evenly with 4 slips in a 40 cm diameter container. Plant them a little away from the edge. Plant them deep, sweet potatoes will send out roots from each leaf node, so your 30 cm slip can be planted at 20 cm deep. So only 10cm above the ground. Keep moist, mulch around the plants and fertilise with a low nitrogen fertiliser. One of the big problems is over watering, if the ground is moist, do not water so much. We have been asked why home grown sweet potatoes can taste bitter. The answer is simple, they need to cure to allow the starches to begin to convert to sugars. 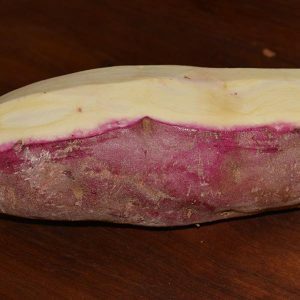 So it is natural for newly harvested sweet potatoes to taste a little bitter. The method of curing is to place the newly harvested tuber in a warm room at around 85 F (29 C) for around 1 – 2 weeks. With a humidity of around 85 – 90 % you can us a humidifier if needed. This also allows any scratches or small cuts to heal. Good air flow is important during curing. You can also use a greenhouse or hoop tunnel for around 2 – 3 weeks if you don’t have other facilities. After this they can be stored in a cooler position at around 55 F (13 C) in a position with good air flow. Wire racks, milk crates and similar are good for curing and storing as they allow for good air flow. Sweet potatoes can be stored for around 5 – 6 months. REMEMBER TO ROTATE CROPS, plant in a different bed each year on a three year rotation. And in mid to late autumn your sweet potatoes should be ready to harvest. Yes you can grow them in a deep container, same routine as for in the garden.